Caleb Hammond holds the championship belt from the 2018 Front Row Challenge at the Southern Iowa Speedway in Oskaloosa. Caleb Hammond has stopped treatment for leukemia. The racing fan from Iowa is asking for stickers to put on his casket. Continue life behind hospital walls going through painful treatments that wouldn't cure him, or bring Caleb home to live out the rest of his life with his family in Oskaloosa, Iowa. "There were some other options left, but they were going to make him sick and do harm to his body," said his uncle, Chris Playle, 42, of Oskaloosa. "They decided to call it quits and come home and be a kid and do the things he hasn’t been able to do the last year-and-a-half." 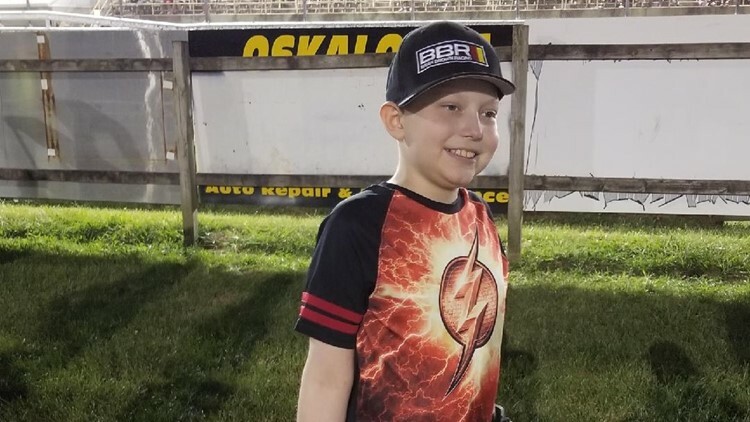 Caleb, an avid racing fan, is now asking people to send him stickers so they can be placed on his casket after he dies from cancer. The response so far has been overwhelming, said Playle, who is speaking on behalf of the family while they spend as much time as possible with Caleb. "We’re trying to get a bunch of them. We’re trying to decorate his casket," Playle said. "We’re just trying to do as much as we can with him while he’s here." When Caleb was 2-years-old, he would visit his uncle's house across from the Southern Iowa Speedway in Oskaloosa. Before the pits opened, drivers parked their cars on the streets, and Playle would bring Caleb outside to see them. When the pits opened, they watched as a parade of colorful cars zoomed into the speedway. Once they started racing, the pair would pull up some lawn chairs and watch the cars make their laps. "He’s my racing buddy. It was kind of our deal," Playle said. "I probably had just as much fun as he did." The first time he attended Front Row Challenge, which brings NASCAR drivers to Oskaloosa to compete for $20,000, Caleb met professional race car driver Kasey Kahne. "He was all smiles. Enjoyed it quite a bit," Playle said. "Just being able to go, it was a good time." Three weeks before Caleb was diagnosed with B-cell acute lymphoblastic leukemia, he was in pain. At first, his family thought it was growing pains, but a doctor said it was a virus working its way out of his body. Then it spread. His shoulder and neck hurt. There was recurring leg pain. Doctors thought it was mononucleosis or walking pneumonia, according to the family's GoFundMe page. They got a second opinion at Blank Children's Hospital in Des Moines in February 2017 and learned his aches were anything but minor. Caleb was diagnosed with leukemia at age 9. A month later, doctors told Caleb's family that he had a more acute form of leukemia. Caleb started a chemotherapy plan. He was in a medically-induced coma for a week. He was on dialysis and had symptoms of heart failure. When he came out of the coma, he learned to eat, write and walk again, according to the family's GoFundMe page. He spent nearly three months in the hospital. In January, Caleb and his family traveled to Tennessee for a bone marrow transplant, returning to Oskaloosa on May 3. The leukemia came back aggressively. Treatments weren't helping and, eventually, Caleb and his family decided to spend time together at home. He's been home for about three weeks, Playle said. Caleb turned 11 on Aug. 14. "Medically, he’s still pretty strong," Playle said. "I know later on in the evenings he’s tired, he’s ready to settle down … He gets worn-out kind of easy. But otherwise, he’s still pretty strong and spirits still pretty high." Now that Caleb is back home, he's doing normal activities he refrained from when he was stuck behind hospital walls. He enjoys playing with Legos. On his birthday, good Samaritans brought a monster truck for him to ride in. But on Saturday evening, he's in for his biggest surprise when he gets a chance to drive a hobby stock race car and experience every part of the sport he loves. "We noticed Caleb looking for stickers to cover his casket. Why do you want stickers? What’s going on?" said Jared Foster, board president and co-founder of Team Kids With Cancer Racing 46-7. "The board decided we need to do something and we need to get him to race." The organization, based out of Melvin, Iowa, works to send goody bags to kids with cancer, while providing them opportunities to see and experience race cars. Foster said Caleb is going to to get the whole gambit. From an honorary license to a fire suit, Caleb will drive a six-lap heat race and get a salute stop to welcome him into the racing community. The organization is also taking free-will donations at the event that will go to Caleb's family to help with expenses. Playle is most excited to see Caleb's surprise on Saturday. "I just want to see his face," Playle said. "With everything going on, I hope there’s a ton of people." On social media, Caleb's shout-out for stickers has resonated with the racing community. Shops and racers nationwide have been posting Caleb's story and pictures of the stickers they're sending in. Throughout his struggles, Caleb has stayed strong, Playle said. And while the family still has him, he's going to go out and see as much racing as possible. "We’re just trying to get some racing in and trying to do everything we can to keep the spirit up," Playle said. "The support and everything, all the cards he’s receiving in the mail, it’s been overwhelming." Stickers and cards can be sent to Caleb Hammond's family at 314 North J Street, Oskaloosa, IA 52577. To donate towards Caleb's expenses, visit the family's GoFundMe page.